I usually leave the talk radio blather watching to the experts, but I went on a hunch hunting trip this morning and had to share. Yesterday afternoon Dori was railing about how even though he liked Ron Sims' idea for transportation in King County, he wouldn't actually vote for a tax increase to support it. His reasoning was, that according to the Tax Foundation Washington state has the fourth highest tax burden in the country, taking into consideration all sources of taxes, state local federal. The implication is that while everyone in every state pays an equal share of the federal burden, our state and local burden is so freaking high, that how can we be expected to pay more? Actually, the opposit is true. 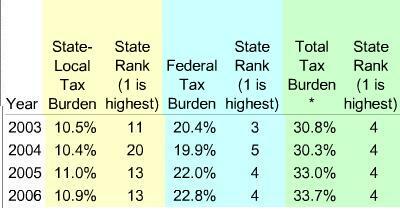 Our local/state tax burden is lower than our federal burden, way lower. Our local tax burden is 13th, and 20th in the year the Dori kept on yelling about (2004). Our federal burden is much higher and actually brings out total tax burden way up. And, when you look at per-capita state and local collections in 2004, we're even lower at 18th. Not only that, but Washington state government, in terms of per capita spending, puts more money out there than most other states, putting us at 6th in the nation in that category. On average, Washington citizens put $3,452 into state and local government, and then those governments put over $8,000 of that back as investments in education, roads, etc. I don't know where they come up with the other $5,000 per head, but it sounds like a pretty good deal to me.